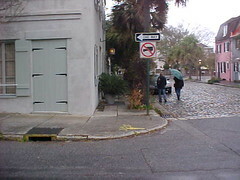 Charleston, Church St. at Chalmers. An example of overgrown vegetation and landscaping allowed to invade public space and block sidewalks. Ambiance of neighborhood is literally being choked out by poor management and maintenance. Photo taken in 2003.